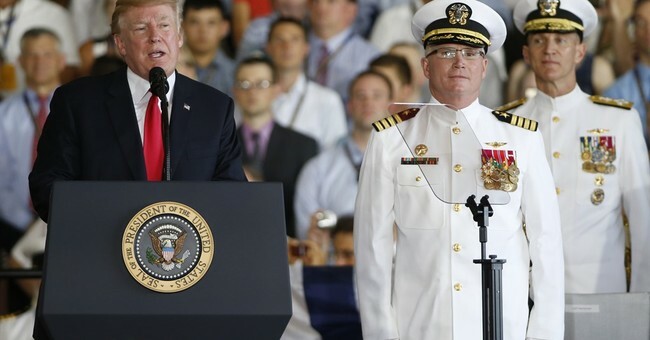 President Trump Commissions USS Gerald R. Ford, "A 100,000 Ton Message to the World"
America's newest aircraft carrier, the USS Gerald R Ford, was placed into commission Saturday in Norfolk, VA by President Trump. In his remarks, Trump praised the efforts and patriotism of the shipbuilders who crafted the Ford and the sailors who will eventually serve aboard it, and reminded the audience of the legacy of service and American values of its namesake. It wouldn't be a Trump speech without a reference to the greatness of America. American steel and American hands have constructed a 100,000-ton message to the world: American might is second to none, and we’re getting bigger, and better, and stronger every day of my administration. That I can tell you. Wherever this vessel cuts through the horizon, our allies will rest easy and our enemies will shake with fear because everyone will know that America is coming and America is coming strong. Trump reminded the audience of President Gerald Ford's military service and values. [I]t is so fitting that this ship is named after a sailor of tremendous character, integrity, and wisdom. [A]fter Pearl Harbor, he volunteered to serve. President Ford joined the Navy and asked to be sent to sea. He wanted to do that very badly. He never really knew why; he felt it was a calling. He was assigned to a new carrier — the Monterey — becoming a plankowner himself on its commissioning in 1943. Of course, the strength of our nation isn't in its equipment, but in its warriors and patriots, as President Trump emphasized. Having the best technology and equipment is only one part of the American military dominance. Our true strength is our people. Our greatest weapon is all of you. Our nation endures because we have citizens who love America and who are willing to fight for America. To every patriot who will serve on this ship today and throughout history, I say this: Keep the watch, protect her, defend her, and love her. Good luck and Godspeed. The USS Gerald R Ford is under the command of Captain Richard McCormack. It underwent sea trials earlier this year, but must still pass a series of tests, which are expected to take up to four years, before being deployed.